In the early 20th century there were high hopes of profitable oil extraction in many parts of southern South America. Most of these came to nothing, but in Chilean Tierra del Fuego, around Comodoro Rivadavia and in the Neuquén territory the results were more promising. 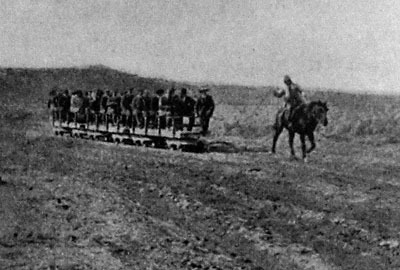 After the first world war exploitation of the latter began in earnest, with the biggest concentration around the station of Plaza Huincul along the FCS's Zapala extension west of Neuquén. The Standard Oil Co. introduced a 60cm gauge system in the early 1930s to link its wells to Challaco railway station (1). The national oil company - Yacimientos Petroliferos Fiscales - developed a network of 60cm gauge lines to transport materials to each and every oil well (1). This lasted until the 1960s. Equipment included Ferrostaal diesel locos. An early inspection of the Plaza Huincul oilfield, as illustrated in Arturo Coleman's autobiography. A rather later photo showing a diesel loco hauling a mixed train (2). 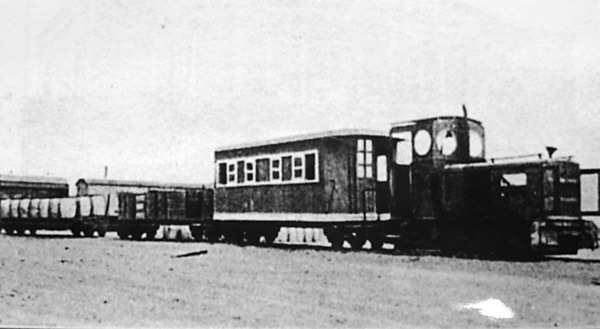 There are broad gauge vehicles in the background, suggesting that this may have been at Plaza Huincul station. 1 Los Industriales de la vía Neuquén. Jorge Waddell, in Todo Trenes no. 32, 2004. Buenos Aires. 2 Reproduced by kind permission of the Fundación Museo Ferroviario.